Nominate outstanding people for the “Help Somebody” recognition! Have you witnessed someone selflessly going out of their way to improve the life of another? Do you seek a simple way to recognize and commend them for their benevolence? 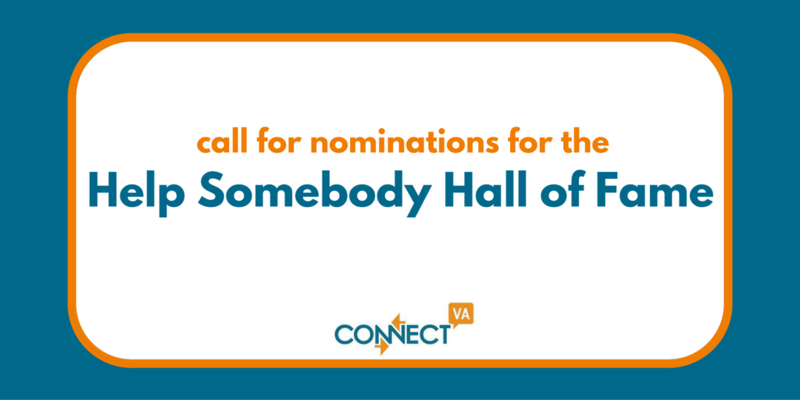 The Help Somebody Hall of Fame is a platform to express your gratitude for this person and share stories that may inspire others to act with generosity. A nonprofit organization could also receive $1000 in honor of the person you nominate (see below). Nominations can recognize a nonprofit staff member, client, volunteer, neighbor.…anyone residing in Greater Richmond who you want to commend for making a positive difference. We’ll add a new name to the Hall of Fame two times each month, and feature their story on ConnectVA.org and through social media. 1) How does this person demonstrate the spirit of the “Help Somebody Hall of Fame” – acting selflessly to improve the life of someone else? 2) What is the impact of their generosity? 3) Is there anything else you want to share about your nominee that makes them unique and/or a model for making a positive difference (optional)? Each quarter, a random drawing will be held and two $1,000 awards will be made to a nonprofit organization, in honor of a nominated outstanding community member (chosen by the nominee). The award is made possible by an anonymous donor through The Community Foundation serving Richmond and Central Virginia.